I like to prepare my kids when we're going somewhere new. Not to the point of trying to control their reactions to the things they see, but just to give them a general guideline as to what kind of place we're heading into, and what kind of behavior is expected of them. The problem comes when I'm not exactly sure what kind of place it is that we're heading to. When we took our kids to the Lincoln Memorial, it was a first visit for all of us, so I was taking a complete guess at what it would be like. 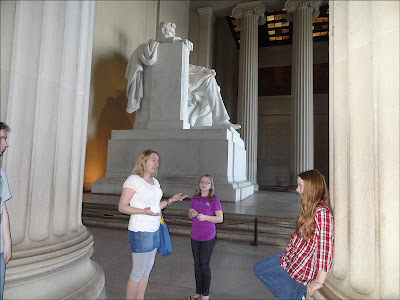 Basing my preamble around the word "Memorial", I told the kids to be prepared for a place of reverence and reflection. It would probably be very quiet, and they would be required to be on their best behavior. I won't be needing that speech again. It turns out that the word "memorial" has multiple meanings. Out West it means "A structure that reminds people of a person or event". 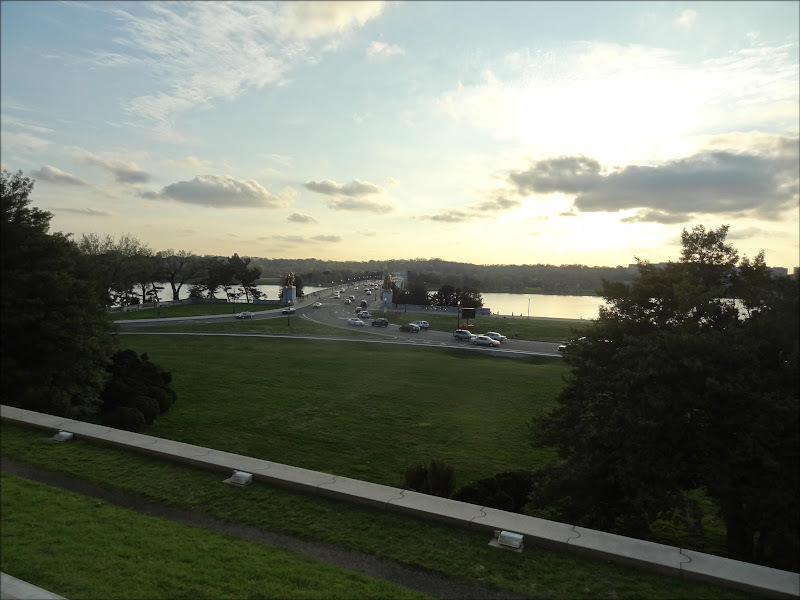 Apparently in Washington, D.C. it means "A place for joggers to turn around". Getting to the Lincoln Memorial involved navigating our way through a maze of people out for a run, all of whom decided that the base of the memorial was the perfect place to reverse course. It makes sense really as the Lincoln Memorial is located at the far west end of the park, so although it detracted from the atmosphere a little, it wasn't a huge inconvenience. I can't say the same for the people running the stairs. When you're talking to your kids about the accomplishments of Lincoln's life, and a shirtless guy runs up beside you and slaps his sweaty hand print on the wall before turning and heading back down the stairs, it takes a little bit away from the educational focus of the moment (although the value of that education is certainly in question to begin with). Memorial also seems to mean "A place for children to misbehave". I understand that kids might not find the Lincoln Memorial the most interesting, but there are ways to deal with your boredom. Sliding down the marble banisters over and over again, despite being asked by both the park ranger and the security guard not to, is not one of the acceptable methods. Even my own children, who are prone to their own moments of questionable choices, were amazed that this 12 year old kid didn't seem to grasp the situation. Of course it's not like anybody was stopping him. The park ranger had to go back to giving his lecture, but the security guards were busy on their phones, texting away. 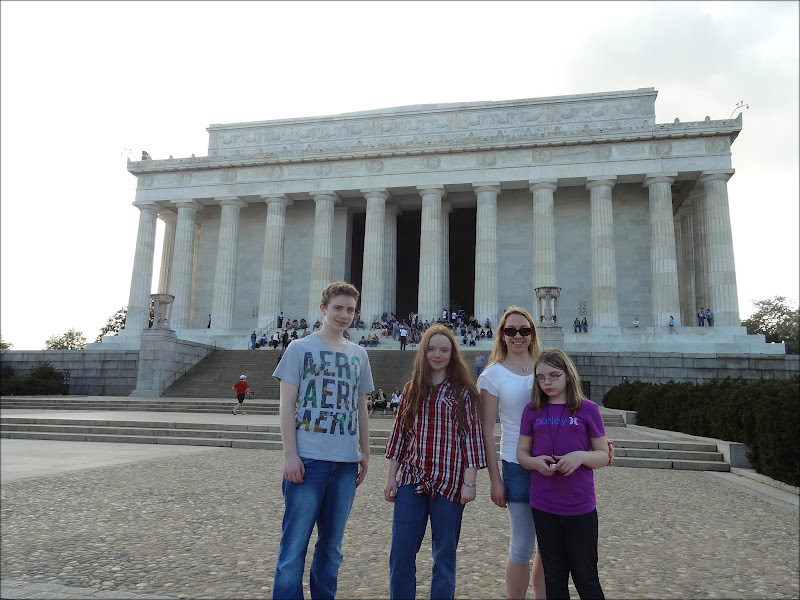 I know Lincoln was a patient man, but I wonder if he would have had a woodshed and a stick for kids like that. Lastly, at the time of our visit, memorial meant "A place under construction". 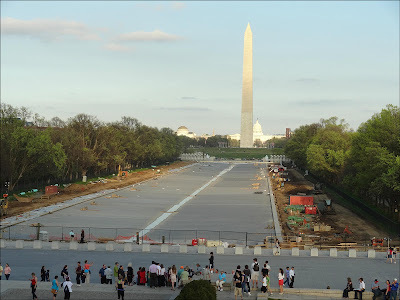 It has to be done, but it was unfortunate that the reflecting pool between the Washington Monument and the Lincoln Memorial was empty and under construction. Not only did this take away from what I imagine would be an amazing view, but it completely foiled Lori's plan to recreate the scene from Forrest Gump. Upon seeing the reflecting pool under construction, the boy assured us that he would have been more than willing to run through the water to help his Mom out. We'll see if he's as willing on a return trip, as I really would like to sit on the steps of the Lincoln Memorial one day when the reflecting pool is reopened. 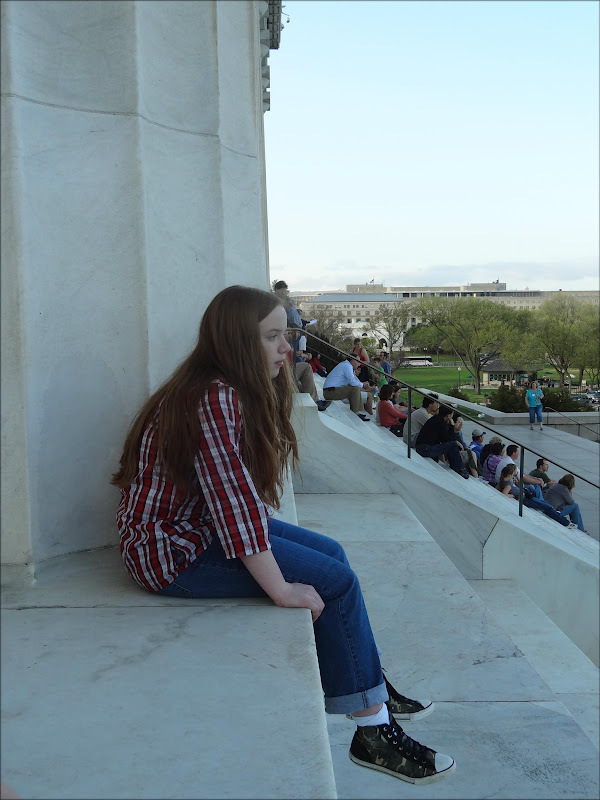 The Lincoln Memorial is a neat place, but between the construction, the joggers, and the out of control kids, it lacks a place to sit quietly and reflect upon the things that Lincoln did in his lifetime. Fortunately, I had been tipped off. My friend Deej at World of Deej had written about his favorite spot at the Lincoln Memorial - around back. We followed his instructions around to the backside of the memorial, and there we found a few moments of tranquillity to sit and take in the beauty of a spring day in the nation's capital. That spot is what I envisioned a memorial to be like, not the noise and chaos that was taking place out front, and it was there that I could gather my thoughts about the memorial, what Lincoln had done for his country, and of course, just how cool it would be to slide all the way down those marble banisters. I'm not real good with quiet time.